Lodging in Copper Mountain: Condo or Hotel Room? If you're thinking about your choices for lodging in Copper Mountain, consider the advantages of renting a condo over a hotel room. All of our Copper condos are slope-side, with easy access to the chairlifts and no more driving once you arrive at the resort. If you stay in a Frisco hotel, you’ll have to commute to Copper Mountain and it could take up to an hour from the time you leave the hotel, to the time you’re on the slopes. Condos, especially the multi-bedroom units, are much roomier than the hotel rooms you'll find in Summit County. So you'll have room for your entire group in one unit, which saves on cost, and you’ll love the extra space to spread out that ski gear. There's nothing like putting on ski boots that have been warming by the fireplace all night long. You can’t do that in a hotel room! 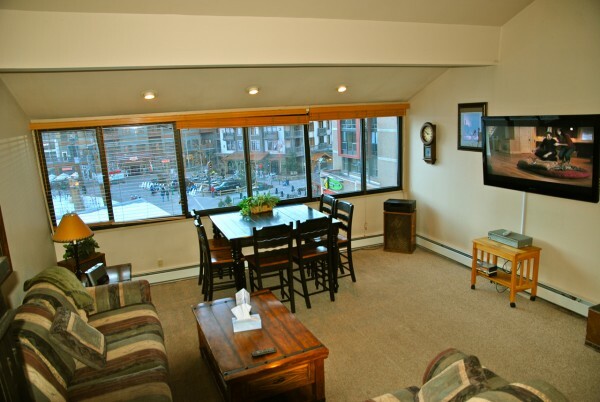 Our condos also feature unique layouts rather than the cookie-cutter style of most hotels and motels. We can help you find lodging in Copper Mountain that's perfect for your group, whether it's one couple, two families with kids, or a group of old college ski buddies getting together for a spring break flashback. All of our condos feature fantastic views, looking toward the slopes, hot tubs and pools, or toward the rugged summit crags of the Ten Mile Range. You can often enjoy those views from the comfort of a private deck, sipping an apres-ski drink while the setting sun casts a glow on the snow-covered Rocky Mountains. There’s no guarantee of a view if you stay in a hotel room. All of our condo lodging in Copper Mountain has fully equipped kitchens and plenty of space to store food for a crew of hungry skiers or snowboarders. Sure, you'll want to sample the fare at the resort's newest eateries once or twice, but there's nothing better after a long day on the slopes than a vat of home-cooked chili or pasta. And you'll find everything you need (except the food) at our Copper Mountain rental condos. You’ll have to eat every meal out if you stay in a hotel room with no kitchen. Whatever your needs, Copper Colorado Condos can direct you to the best Copper Mountain vacation rental available. We’ll also make sure you find the best deals on rentals and lift tickets. You can check availability and book online now right here on our website, or feel free to contact us now if you need assistance with your condo choice. With our help, we’ll convince you of the benefits of choosing a condo over a hotel room!